Organizing a garage can be a monumental task for most as the garage ends up being the last bastion of messes and storage. 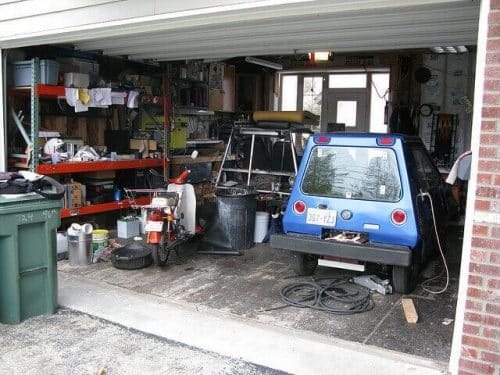 One of the main reasons garages become so cluttered is because of the lack of a clearly defined space. Unlike your room which has a apparent place for everything, such as a dresser for clothes and a desk for stationary supplies, the garage is a difficult place to keep areas well defined. Fortunately, there is a quick and easy way to help you out: paint. , create a parking sport for your car so that you park in the same location everything. This creates a border that will allow you to see if your clutter is slowing taking over extra space in your garage. to label the space. For example, create a space that is for brooms and cleaning materials only. 3. Label Shelves: It is when things get stored and organized haphazardly that disorganization occurs. So make sure everyone knows where everything is supposed to go on shelves by painting on labels. In the end, creating defined spaces will help you organize, and more importantly keep your things organized in your garage.